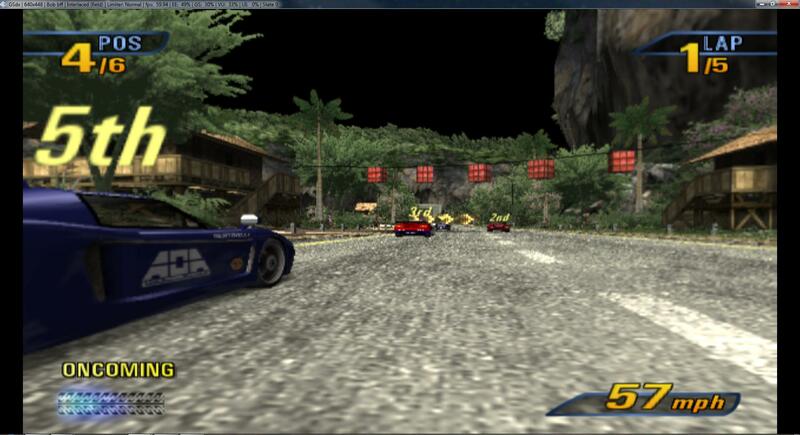 See how down near the track, the cars and the track are extremely pixelated? Please don't tell me the answer is to download one of those friggin SVN revisions, where you have to spend 8 hours compiling 60 different things in Visual Studio (Assuming you have the 2008 version which you can't get from Microsoft anymore), I tried that already and subsequently gave up because it's way more difficult than it should be. There is nothing to compile with SVN revisions. The versions provided on the website are all compiled and no more difficult to install than the regular releases. Unpack, run, done. That aside, looks like you're running in native resolution and just stretching the image and/or running in software mode. Try increasing the internal resolution in GSdx settings and make sure you have texture filtering enabled and use hardware mode instead. (12-16-2012, 08:55 AM)Eloris Wrote: There is nothing to compile with SVN revisions. The versions provided on the website are all compiled and no more difficult to install than the regular releases. Unpack, run, done. I've been wondering how you're supposed to use these, and which ones to use for which situation. I've tried reading into it but I keep hearing different explanations for how to do it, and little on what it actually does. (12-16-2012, 09:18 AM)ahlycks Wrote: I've been wondering how you're supposed to use these, and which ones to use for which situation. Normally you would need to compile SVN revisions but there is a bot doing it now, navigate and you should find the last version built by it. SVN compiling issues aside, i suspect the answer lies in your GSDX config, so can you post a picture of your GSDX settings please?